Shotokan Karate – Do (the way of Shotokan karate) is essentially a Japanese Martial Art however its founder Gichin Funakoshi was from Okinawa. He took his form of Karate to Japan in the 1900’s, prior to this time Karate was known as Tang Hand (Chinese hand) clearly showing that its roots lie in the fighting systems of China. Due to long standing problems between China and Japan Gichin Funakoshi and his Okinawan contemporaries felt that the more politically expedient term of “Empty Hand” should be used on the mainland of Japan, thus the way of the Empty Hand was born. After several years of striving Gichin Funakoshi managed to get Karate introduced into the Japanese University system, at this point the sport of Karate was created. Whilst detracting slightly from its original intention of a self defence and personal development system (Karate-Do) creating the sport of Karate popularised the art around the world and at this point it remains a popular activity across the globe. Karate is a great activity and can be practiced by young and old alike. 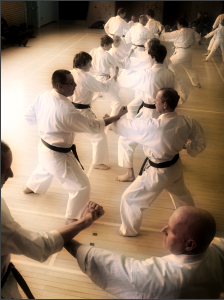 Many of our members train together with their close friends and family.